One of the most popular family dogs is the British Labrador retriever. These Labs are ideal for the family because they have a loving nature and are easily trained. Labradors are renowned for their loyalty and friendliness, but it should not be forgotten that the breed is split into various types. Among the Labrador breed you have both British and American Labs, and there are differences between the two. Physically, the British Lab is both slimmer and shorter than the American. British Labs are also renowned as having finer features than American ones. They also have superior smell, making them the favoured gaming dog. Many believe the Labrador Retriever and the larger Newfoundland breed descend from the same ancestor. In fact, the Lab used to be called the Lesser Newfoundland. The breed was first discovered in Newfoundland by Colonel Peter Hawker. At the time the breed was called by locals the St. John's Newfoundland. The breed was also noted as early as 1662 for the keen sense of smell and hunting ability. The dog's are believed to have come to England by settlers that moved from England to St. John's in Newfoundland. The first Labs found their way into England via the Port of Poole in Dorset, England. In Dorset, the second Earl of Malmesbury liked the breed for hunting and arranged for more dogs to be brought to England in 1882. The Earl of Malmesbury started a breeding program, naming the breed Labrador.The Earl described how water moves off the coat "like oil" and the otter shaped tail. 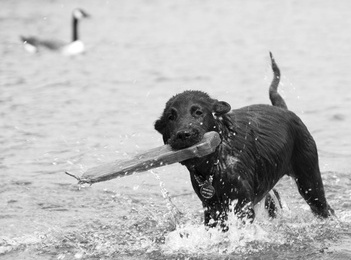 The Earl gave Labrador's to friends throughout England who were cherished for their retrieving and swimming skills. Due to quarantine laws in England, the breed was further developed in the U.K. and a British breed standard was developed. The American Labrador is a direct descendant of British Labs that were brought to the U.S. in either 1914 or 1917. The British Kennel Club officially recognized the Labrador Retriever Breed in 1903. Both the American and British Labs have quite different temperaments. Though both are renowned as friendly dogs, breeding has produced differences. The American Lab, having been bred for hunting, tends to be bigger, stronger and more aggressive than its British cousin. The British Lab has been bred to become a good retriever, especially for wild fowl hunters, which has turned them into good swimmers. Many hunters prefer to use a Brit dog because they are calmer and not as easily agitated as their American counterparts, and can remain static longer. They can also be trained earlier because they mature more quickly than American Labs. And because of their less excitable nature, British Labs are a great dog for all ages. The calmness associated with the British variety has seen it become the preferred pet of Lab lovers. Their placidness, and the ability to train them at an early age, means they are the ideal pet for the young family. In general, Labradors are a healthy breed with few health concerns. High quality breeders will always attempt to avoid genetic problems found in Labradors in addition to breeding for qualities such as temperament and working ability. The British Labrador Retriever Club recommends that puppy buyers only buy from Lab breeders that have parents BVA/KC hip scored and eye examined as being unaffected. Dogs should also be checked for general progressive retinal atrophy. Work is also underway to understand the increased risk in Labs for three types of dog cancers; mast cell tumours, melanomas, and soft-tissue sarcomas.